Advent to me has always meant preparation. As a child, my brother and I each had an Advent calendar that we would tape to the outside of our bedroom doors, opening a door each morning to discover a little phrase or image on the glittered cardstock. They were typically scenes of Bethlehem or a cityscape full of windows with mysteries behind them. We also had a family advent wreath, made from greens we had gathered from the pine trees in the woods behind our house. My mom would decorate the mantle with candles, greens, and family objects handed down through the generations. And we would set up the crèche, placing the kings and camels far from the little stable, with the shepherds and the sheep usually placed on a high shelf nearby, while Mary and Joseph waited over an empty manger. The Christmas tree was put up on Christmas Eve; my dad put on the lights, and I was lifted high to place the angel atop. Stockings were hung, cookies and milk put out, and we were put to bed to awaken to magic in the wee hours of the morning. As an adult and parent, I replicated these traditions with my children with our own spin and additions. The Christmas tree was put up a bit earlier (much to their chagrin since they wanted it up right after Thanksgiving), but the Advent wreath and calendars were always part of our “getting ready” to help us count down the days. And then there was the Christmas pageant. This was the “big” preparation that we set time apart for each Saturday morning. Learning the lines from Scripture, and practicing the hymns that tell this most important story. In my previous “life” I was a Director of Christian Education at another parish; over the years I must have directed at least twenty pageants. This past Sunday I had to smile as I saw Becky Hudspeth carrying angel costumes and wings through the narthex as rehearsals are in full swing at St. Matthew’s. For me, the Christmas pageant is the tradition that we give our children year after year to learn the story of Christ’s birth. It is part of preparing to bring the new baby Jesus into our lives yet again, filled with the hope, and dare I say “magic,” into our hearts and memories. We learn best when we participate in God’s Story. 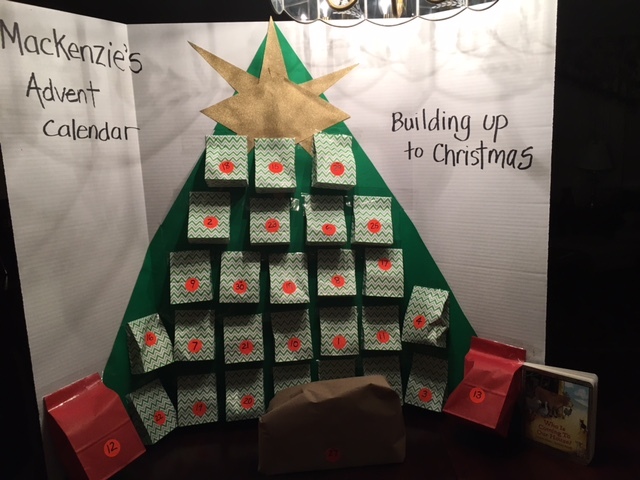 This Advent my 20-month-old granddaughter has an Advent calendar that I made for her. Within each little bag that she opens every evening she discovers a piece of the Christmas story. So she now plays with a camel, angel, sheep, donkey, Mary, and Joseph (with more figures yet to come over the next few weeks). And I notice the Advent wreath on their dining room table, continuing the tradition of lighting the way as we count down the days. What traditions do you treasure? What traditions are you creating with your family? 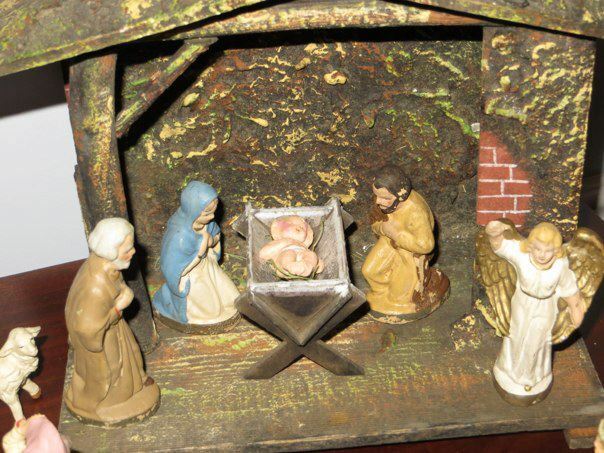 The Christmas Story told by the children of St. Paul’s Church, Auckland, New Zealand. Sharon! We have a very similar Nativity scene–the angels and the barn look the same, anyway–but the rest of the figures are different. The story we were told was that my husband’s grandfather purchased the set in 1924 at FAO Schwartz in Ardmore, PA, for the first Christmas of his first child (my husband’s uncle.) Would yours be of the same vintage? My parents were married in 1950, and my understanding is that this was a gift given to them by my father’s parents. Mary & Joseph, one king, and the angel I believe are original. There is also a “fire” figure and a “well” figure. Other pieces got added along the way as things broke, I assume. This must have been a popular set, I have a friend in Denver who has his parents’ set and much of it is identical too. Mine were probably purchased in Norwalk, CT although there is a small (very small) chance they were purchased in New York City. My father was born in 1924, so perhaps it was something his family already had when he was a child. Very interesting, thanks for sharing!